With fantastic beaches nearby and two rock pools at either end of Manly’s main beach, you might wonder why have such a massive pool complex in Manly? But this is a great asset to the community. 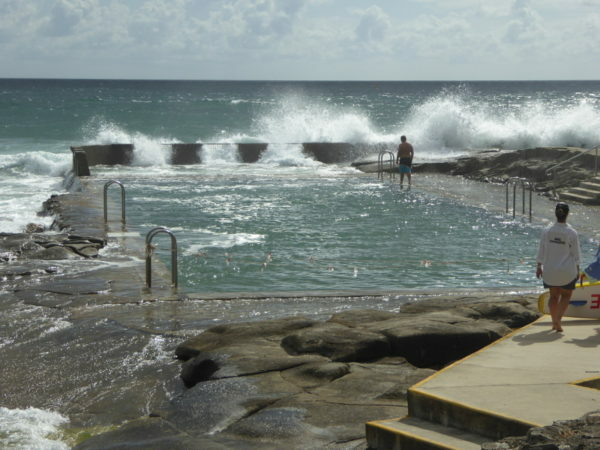 As another swimming blogger points out (see links below), this is only one of two pools like this in the northern beaches area, and as I found out in April after Sydney’s big storm in 2015, you can’t always swim in the ocean or the ocean pools. They’re on a massive rebuild here at the Boy Charlton Swim Centre. It sounds as if they’ll have eight or nine pools by the time they’re finished, though not all outdoors and many of them mini pools for kids and others. This wonderful 50m Olympic pool will not be affected by the changes, though, so you can still swim laps along the lanes Michael Phelps may have swum in as he prepared for the Sydney Olympics. I’ve been here before on hot, summers days and found it very busy. Back in those days, I used to struggle with the 50m laps since most pools back home in the UK are 25m, but now eight months into my time in Australia, I seem to have got used to the Olympic size pools and was comfortable doing my 20 lengths to reach a 1km swim, actually for the first time ever! And the great thing about coming here on a midweek afternoon in winter is that the pool was virtually empty, so lots of space to do my backstroke laps as well as freestyle, and time for the lifeguards to chat after my swim, too. The new pools being built at the moment will have better access, lifeguards told me, including a disabled ramp. The steps out of the pool at the moment in the shallow end are very tight and you need to tuck your toes in there to get a grip. Nice changing rooms with warm showers. They are only partly covered, though, so the toilets are exposed to the elements as are most of the benches for your things and the showers. OK on a sunny day but can’t be much fun on a rainy day (there is one bench that is covered by a kind of awning, though). Entry fee $7.80 in 2015. Pool depth goes from 1m in the shallow to a lovely 1.9m in the deep. You’ll see which lifeguards are on duty on the pool temperature board as you come into the complex. The lifeguards tend to be a fount of knowledge on the past of the pool. Various Olympic swimmers have trained here in the past, most notably the Americans pre-Sydney Olympics, including Michael Phelps. Also the infamous Aussie women’s relay team that won gold one year only to be disqualified when they leapt into the pool in their joy at winning, disturbing the last finishers and so being penalised. They also have various water polo stars swimming here, though I’m not an expert in that field (or pond); and one guy they pointed out on the far side of the pool likes to swim marathons, including some unthinkable swim up the west coast of Australia from Perth. Don’t miss the room behind the lifeguard seats where you’ll find a series of old photographs of former swimmers here, mainly from the Manly Diggers Swim Club (see link below). And my favourite historical marker at the pool is hidden away on the side wall of the changing rooms. It’s a wonderful mural warning of the dangers of the sun ‘Every minute…’. They don’t paint them like that anymore. The place I liked best was a ten minute walk back to Pittwater Road anyway, but it closed down some time in 2016, so you’re probably better going to Manly for coffee, unless someone has a better idea?